The human brain is a highly organized structure and the cerebral cortex in particular has expanded massively in size during evolution. The cerebral cortex is arranged into layers of specialized neuron subtypes formed during development by orchestrated stem cell maintenance, expansion, fate commitment and differentiation. The cortical neural stem cells generate billions of neurons in a systematic fashion. The mechanisms and their interplay that control most aspects of human brain development are unclear. This is partially due to the ethical and practical challenges associated with analyzing fetal human development. Recent progress into understanding the formation of the human brain has taken advantage of in vitro modeling of corticogenesis using pluripotent cells. 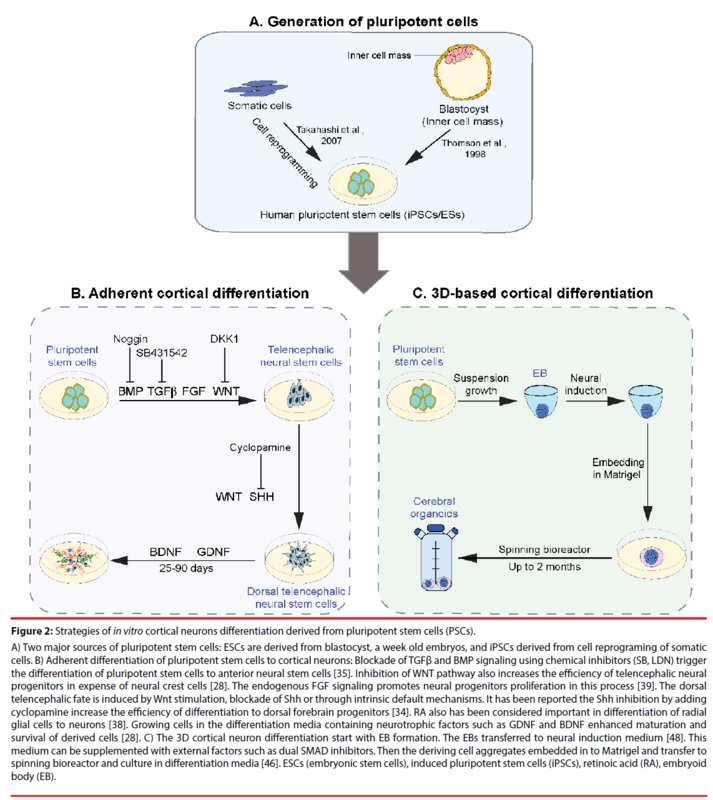 Human pluripotent stem cells and procedures developed for their differentiation provided previously unavailable opportunities to study the mechanisms involved in development of the cerebral cortex. These human cell culture models can be applied to address specific biological questions and have been successfully utilized to investigate mechanisms associated, not only with normal brain development, but also neuropsychiatric disorders. Here, we review the recent literature that uses these cell culture models to study human corticogenesis. Then, we discuss the challenges and limitations of the current models. The cerebral cortex of mammals is a unique and complex structure composed of diverse neural cell types organized into precise networks . Despite its complexity, the cerebral cortex originates from a simple anlage consisting of a polarized sheet of pseudostratified epithelial cells, the neural epithelium . The mechanisms controlling cerebral cortex development have been of major interests for neurobiologists, and have been intensively studied over the past decades. Decoding the key aspects of human cerebral cortex development could enable new therapeutic approaches to be developed for the prevention and treatment of devastating brain disorders. Animal models have provided significant insights into the development, structure and function of the brain and about the mechanisms leading to neurological disorders . Despite the basic similarities between cerebral cortex development in different species, the human neocortex has some key and unique cellular and molecular characteristics that cannot be captured by classic animal models including an expanded outer sub ventricular zone (OSVZ), specific progenitors and an increased number of neurons [4,5]. Over the last years, there has been a huge effort to find ways to study human brain development. Significant progress has been made towards decoding the mechanisms controlling the generation of the human cerebral cortex by using embryonic tissues from aborted fetuses . However, when using fetal-derived tissue one is faced with many challenges including difficulties in accessibility and ethical issues. Hence, the wide application of human fetal tissues for research is rather restricted. The advent of human pluripotent stem cells, embryonic stem cells (ESCs) and induced pluripotent cells (iPSCs), opened new opportunities to study organogenesis. Human pluripotent cells are useful for studying developmental processes and also disease mechanism and for drug screening to find new treatment strategies . In this review, we outline the basic process of cerebral cortex development in humans. Then, we will review the different strategies currently available for studying the mechanism of human cortical differentiation from pluripotent stem cells with a particular focus on the formation of the six-layered isocortex with its different subtypes of excitatory neurons. Finally, we discuss the advantages and limitations of the current protocols. The cerebral cortex is organized into layers forming an isocortex. The laminar cytoarchitecture of the cerebral cortex is preserved among mammals. The six different layers (layer I-VI) contain different subtypes of neurons with specific functions, connections and gene expression (Figure 1). The neuron types can be simply divided into glutamatergic excitatory projection neurons that transmit information over longer distances and GABAergic inhibitory interneurons that modulate local information flux [3,7]. However, within this basic segregation, neurons are divided into subtypes. For example, deep cortical layers (VI and V) contain mainly TBR1+ and CTIP2+ corticothalamic projection neurons and subcortical projection neurons, which project and carry information from the cerebral cortex to subcortical structures including the thalamus. The more superficial layers (IV-II) contain SATB2+, CUX1+, BRN2+ callosal projection neurons that project to contralateral brain regions thereby transmitting information from one brain hemisphere to the other . Figure 1: Human cerebral cortex development. During human cortical development, neurons in the cerebral cortex are generated sequentially in an inside-out order from stem cells and progenitors residing in the ventricular zone (VZ) and subventricular zone (SVZ) of the neural tube . In humans and other primates, the subventricular zone is expanded and divided into the inner subventricular zone (ISVZ) and outer subventricular zone (OSVZ) . The cerebral cortex is organized into six layers (layer I-VI). Projection neurons in each layer express distinct markers and have different morphologies and connection patterns. Deep layers (VI and V) are composed of TBR1+ and CTIP2+ corticothalamic projection and subcortical projection neurons, respectively. Superficial layers contain SATB2+, CUX1+, BRN2+ callosal projection neurons . Intermediate zone (IZ), cortical plate (CP). During development, the excitatory neurons are produced in an inside-out laminar order from neural stem cells and progenitors that reside in proliferative zones, the ventricular zone (VZ) and subventricular zone (SVZ) of dorsal telencephalic region of the neural tube [8,9]. The deep layer neurons are generated at early stages of neurogenesis while the late-born neurons populate the upper layers. Conversely, the interneurons are generated from progenitors in the ventral telencephalon and migrate into the forming cerebral cortex . Astrocytes and oligodendrocytes are produced at the end of embryogenesis and after birth from both the dorsal and ventral telencephalic regions . In this review our main focus will be on the generation of excitatory cortical neurons. Early during cortical development, neuroepithelial (NE) cells form the walls of the neural tube. As neurogenesis commences, VZ NEs transform into radial glial cells, which become the major cortical progenitors in the VZ. Through symmetric and asymmetric cell divisions, radial glia expands the progenitor pool and generate neurons. During the course of cortical neurogenesis, radial glia generates intermediate progenitor populations that expand the precursor pool . The length of cortical neurogenesis differs between species. In humans, cortical neurogenesis is protracted, beginning at gestation week (GW) 5 and ending around gestation week (GW) 30 . In mouse, cortical neurogenesis starts at embryonic day 11 and ends around embryonic day 18, shortly before birth . The basal progenitors are the major type of progenitors in SVZ of rodents. If they divide, they mostly divide symmetrically and give rise to two neurons [3,5]. In humans and other primates, the SVZ is massively expanded compared to in rodents and becomes the major source of cortical neuron progenitors. The human SVZ is so large that it is divided in two regions, the inner subventricular zone (ISVZ) and outer subventricular zone (OSVZ) and contains additional neural progenitor cell types, the outer radial glial cells (ORG) . The expanded progenitor pools and their extended proliferation phases contribute to the increased number of neurons and subsequent folding and gyrification of the primate cerebral cortex [4,13,14]. For decades, pluripotent stem cells have been available for mice and have been a major driving force to study gene function by knockout [15,16]. Pluripotent cells can generate all cell-types of the embryo. However, in other species, the isolation of pluripotent cells has been a challenge. In 1998, the first ESCs were generated from the inner cell mass of an early human embryo paving the way for the generation of specialized human cells and tissues in the laboratory and analysis of the mechanisms controlling early development in human . Due to their high telomerase activity, ESCs are able to divide unlimited times and therefore present an unlimited source of human cells . However, when using human ESCs, one faces major challenges, not least ethical problems as the cells are isolated form human embryos. In 2007, technology for the generation of socalled iPSCs (induced pluripotent stem cells) from human skin fibroblasts was developed . Forced expression of a combination of four transcription factors (Oct3/4, Sox2, Klf4, c-Myc) drives somatic human cells back in their development to an ESC-like state. These four transcription factors play fundamental roles in maintaining the characteristics of pluripotent stem cells by suppressing the genes required for differentiation, and activating genes that promote the pluripotent state . iPSCs are also capable of renewing and presumably differentiating to all cell-types of the body [18,20]. iPSCs share similar gene expression, telomerase activity and epigenetic status of pluripotency genes with ESCs [18,20]. The somatic origin of iPSCs circumvents many of the ethical issues limiting ESC and fetal tissue-based research. Pluripotent cell technology has massively increased the potential for basic research into human biology, regenerative medicine, disease modeling, drug discovery, and stem cell-based therapy . Moreover, iPSC technology enables diseaserelevant cell types to be generated from patients and these can be applied to investigate disease etiology and pathological mechanism. Advances in gene editing techniques, including TALEN [21,22], Zinc finger  and CRISPR [24-27] provide new tools to manipulate pluripotent cells and address mechanisms involved in brain development and disease. The gene editing tools commonly applied to generate mutated iPSCs and ESCs can also be used to repair the mutations in these cells and their progeny . Since the isolation of the first human pluripotent cells, protocols have been developed and continually improved to generate robust culture system that, at least in part, recapitulate in vivo corticogenesis . Cortical neurogenesis is controlled by a combination of intrinsic and extrinsic signals . Correspondingly, in vitro studies have aimed to mimic these extrinsic signals by the addition of cocktails of growth factors and small molecules to the culture medium, promoting cell type specification and differentiation in a temporal fashion . Here, we will summarize recent progress towards the generation of cortical excitatory neurons from pluripotent stem cells (Figure 2). Basically, the differentiation methods can be grouped into two categories: Adherent culture systems for differentiation (Table 1) and differentiation from 3D complex culture structures (Table 2). Figure 2: Strategies of in vitro cortical neurons differentiation derived from pluripotent stem cells (PSCs). A) Two major sources of pluripotent stem cells: ESCs are derived from blastocyst, a week old embryos, and iPSCs derived from cell reprograming of somatic cells. B) Adherent differentiation of pluripotent stem cells to cortical neurons: Blockade of TGFβ and BMP signaling using chemical inhibitors (SB, LDN) trigger the differentiation of pluripotent stem cells to anterior neural stem cells . Inhibition of WNT pathway also increases the efficiency of telencephalic neural progenitors in expense of neural crest cells . The endogenous FGF signaling promotes neural progenitors proliferation in this process . The dorsal telencephalic fate is induced by Wnt stimulation, blockade of Shh or through intrinsic default mechanisms. It has been reported the Shh inhibition by adding cyclopamine increase the efficiency of differentiation to dorsal forebrain progenitors . RA also has been considered important in differentiation of radial glial cells to neurons . Growing cells in the differentiation media containing neurotrophic factors such as GDNF and BDNF enhanced maturation and survival of derived cells . C) The 3D cortical neuron differentiation start with EB formation. The EBs transferred to neural induction medium . This medium can be supplemented with external factors such as dual SMAD inhibitors. Then the deriving cell aggregates embedded in to Matrigel and transfer to spinning bioreactor and culture in differentiation media . ESCs (embryonic stem cells), induced pluripotent stem cells (iPSCs), retinoic acid (RA), embryoid body (EB). -Do not fully mimic cytoarchitecture of in vivo Espuny-Camacho et al. Table 1: Comparison of the adherent protocols to generate cortical neurons. Table 2: Comparison of 3D based differentiation protocols to generate cortical neurons. Pluripotent cells resemble the most primitive cells of the blastocyst. The first step in the adherent cortical neuronal differentiation protocols is to push the pluripotent stem cells towards the ectodermal/neuroectodermal lineages. This step mimics the lineage commitment steps of gastrulation during early development but restricts the fate of the pluripotent cells away from mesoderm and endoderm and favors ectodermal differentiation. Subsequently, ectodermal cells are promoted to adopt neuroectodermal stem cell fates similar to the process of neurulation. Pluripotent cell-derived neuroectodermal cells form NEs that self-organize into rosettelike structures. Rosettes resemble the cellular organization of the early neural tube. Following expansion of NEs, switching the culture conditions and cocktail of factors promotes differentiation to definitive neural cell-types and specific neuron populations. Early adherent cortical differentiation protocols relied on autocrine fibroblast growth factor (FGF) signaling to promote the differentiation of neuroectodermal progenitors that later produced neurons and glial cells . More recently, the differentiation of pluripotent stem cells to dorsal cortical neural fates was enhanced by culturing the cells at reduced cell-density in the presence of cyclopamine, an antagonist of the sonic hedgehog pathway . Sonic hedgehog promotes ventral cell fates in the developing  progenitor differentiation. One significant advance due to this protocol was that long-term culture of the dorsal forebrain progenitors led to the generation of both deep and upper layer neurons in a sequential fashion, similar to cortical differentiation in vivo [3,33]. However, the method favored early neuron subtypes and upper layer neuron differentiation was limited . Subsequently, the initial dorsal neural fate induction step was improved for human pluripotent stem cells by using a combination of BMP and TGF-β receptor inhibitors, Noggin (or the Alk2 and Alk3 BMP receptor inhibitor LDN193189) and SB431542 (an Alk5 TGF-β/ Activin receptor inhibitor), during early stage of differentiation . This also resulted in a more homogeneous and rapid neural conversion. As both TGF-β and BMP signaling pathways act through downstream SMAD transcriptional effectors , the protocol is often referred to as the dual-SMAD inhibitor procedure. Inhibition of TGF-β and BMP signaling increases the efficiency of neuroectodermal fate differentiation by preventing endodermal and mesodermal differentiation . Accordingly, many adherent culture protocols now use dual TGF-β and BMP signaling inhibitors in order to generate neuronal subtypes without the need to pass through embryoid body (EB) formation or culturing the pluripotent cells in the presence of feeder or stromal cells [11,37]. Retinoic acid, a metabolite of vitamin A, has long been known to promote neural differentiation . Hence, logical progression of the dorsal cortical neuron differentiation procedure from pluripotent cells saw the combination of dual TGF-β and BMP signaling inhibition and treatment with retinoic acid . Growing cells at high density under these conditions increased the efficiency of differentiation of mouse and human pluripotent stem cells into cortical neural progenitors . When these dorsal neural progenitors’ cells are differentiated in the presence of brain-derived neurotrophic factor and glial-derived neurotrophic factor over 90 days, deep and upper layer neurons are generated in sequential order. Moreover, the neurons that are generated by this procedure acquire electrophysiological activity during the differentiation . Importantly, the number of upper layer neurons generated in the presence of dual-SMAD inhibitors, retinoic acid, brainderived neurotrophic factor and glial-derived neurotrophic factor is significantly higher than with previous methods. Interestingly, and in contrast to mouse cells, corticoneurogenesis from human pluripotent cells does not require blockade of ventral differentiation using sonic hedgehog antagonist [8,34,37]. Deep and upper layer neurons are generated in culture in a timeframe similar to corticogenesis in vivo and the neurons acquire some degree of maturity over time. Interestingly, the in vitro generated human neurons survived xenografting and integrated into the existing circuitry of host mouse brain . This suggests that both paracrine but also intrinsic programs of differentiation and maturation control cortical neuron development even in vitro. Many standard methods of in vitro differentiation of pluripotent cells, including human ESCs and iPSCs, require the formation of EBs. EBs resembles the gastrulation stage of the embryo and is formed by growing pluripotent cells in aggregates in the presence of serum. EBs give-rise to all three germinal layers of the embryo [39,40]. EBs are then cultured in serum free medium containing supplements and growth factors to select for ectodermal cells and subsequently neuroectodermal cells which go on to generate different types of neurons. As with the adherent culture systems, the presence of retinoic acid during EB differentiation enhances neural fate determination and differentiation. Neurons generated from retinoic acid treated EBs display more mature electrophysiological properties . The formation of NE cells is further enhanced by treatment of EBs with FGF- 2 in serum-free medium . These EB-derived NEs generate rosettes and give-rise to neurons, astrocytes and oligodendrocytes after removal of FGF2 . Importantly, in vitro generated human neural precursors integrate into the mouse brain when xenographted and give-rise to neurons and astrocytes . One of the challenges of the EB differentiation procedure is the variability and relatively uncontrolled differentiation process. Subsequently, the Sasai group refined the 3D culture system of differentiation to neural tissue with two, serum free mouse EB differentiation systems, SFEB  and SFEB-q . These culture paradigms enhance selection for increased telencephalic precursor differentiation in polarized neuroepithelium like structures. Both SFEB and SFEB-q use additions of Wnt and Nodal inhibitors at early stages of differentiation . In the SFEB cultures, Cajal Retzius Reelin+ neurons are generated first, as in vivo, and these are followed by TBR1+ and CTIP2+ deep layer neurons and, subsequently, SATB2+, BRN2+ and CUX1+ upper layer neurons . However, as with most culture systems, the neurons do not form a laminated structure. The SFEB protocols for mouse ESCs were applied to differentiate human ESCs to cortical neurons . Although human pluripotent stem cells differentiated into dorsal telencephalic progenitors, late born upper layer neurons were not generated, even after longer differentiation periods . This suggested that, in addition to the time component, mouse and human cortical differentiation might not be entirely the same and have species-specific mechanism of commitment and differentiation. In an attempt to develop a culture system that more closely recapitulates human brain development, the EB procedure was developed further . EBs were induced to a neuroectodermal fate and then embedded in the extracellular matrix Matrigel . The resulting 3D aggregates formed self-organizing 3D structures, which showed apical basal polarity of the dorsal telencephalon. These structures are referred to as cerebral organoids. When transferred to and cultured further in spinning bioreactors, cerebral organoids continued to grow and differentiate, and ultimately reached 4 mm in diameter . Cerebral organoids contain fluid-filled cavities that resemble ventricles of the postnatal brain and develop VZ and OSVZ like structures [14,48]. Cerebral organoids also contain tissues of other brain regions and further refinement has resulted in cultures that contain a continuous neuroectoderm consisting of forebrain, retinal, midbrain, and hindbrain tissues [46,49]. Upon differentiation and with age, mature organoids contain Reelin+ neurons, early born cortical neurons (TBR1+, CTIP2+) and some late born neurons (SATB2+, BRN2+), although upper layer neurons are rather rare and their lamination is not complete [46,50]. However, neurons in these cerebral oganoids are electrophysiologically active . 3D organoids hold much promise for the analysis of brain development and disease and new protocols can generate specific subregions of the brain [51-53]. Adaptation of the method and combination of small molecule inhibitors including those blocking BMP and TGFβ signaling increase the formation of functional deep and upper layer cortical neurons and glial cells [51-53]. The initial cerebral organoid system was expensive and not very reproducible. However, technical advances have now managed to miniaturize the cultures reducing medium costs and increasing reproducibility . Modeling the differentiation process of cerebral cortex development in vitro from beginning to end is not straightforward due to inherent complexity of the cerebral cortex and lack of a complete understanding of the cellular and molecular mechanisms involved. However, recent pluripotent stem cell culture technologies recapitulate the key molecular and cellular phenotypes of in vivo differentiation. Taken together, the current in vitro corticogenesis models recapitulate three important aspects of in vivo cortical development; 1) Conversion of pluripotent stem cells to neural progenitors under the control of intrinsic mechanisms and inductive factors. 2) Induction of diverse neuronal subtypes and glial cells. 3) Maturation of pluripotent stem cell-derived neurons. Each culture method has certain advantages and limitations. The adherent models of in vitro corticogenesis are robust, cost effective and reproducible (in comparison to 3D based cultures) . Moreover, analyzing and controlling the differentiation of pluripotent cells to specific neuron subtypes is relatively easy. Adding morphogens and growth factors to the culture medium or induction of specific genes can trigger fate specification during differentiation and this is helped considerably by the accessibility of the adherent system. In addition, the adherent systems can be used to guide differentiation to specific neural cell types that can be isolated as relatively homogenous populations for clinical studies, drug discovery and eventually transplantation. However, adherent differentiation culture systems also have some limitations. 1) They do not fully simulate the complex cytoarchitecture and diversity of neuronal cell types in vivo. 2) Functional, complex neuronal circuits tend not to be fully formed as the cultures lack, for example, ventral-derived interneurons. However, these culture systems have been used successfully to study diseases including, Alzheimer [54,55], schizophrenia [56,57], autism spectrum disorder  and bipolar disorder [59,60]. Conversely, while 3D cultures, and particularly cerebral organoid, recapitulated some key features of cortex development, these models also have limitations; 1) They also fail to fully mimic cytoarchitecture of cerebral cortex, and the formation of upper layer neurons, and the six-layered isocortex. 2) Growing EBs to initiate the cultures without external control of fate leads to heterogeneous structures with significant batch-to-batch variability . 3) Although different regions of the cerebral organoids resemble different brain regions, they are randomly organized within the tissue . As with the adherent culture systems, ventral forebrain structures tend to be scarce as a result of intrinsic patterning. However, when generated, inhibitory interneurons are able to migrate through the organoids . To address this migration of ventral inhibitory neurons, Bagley et al. generated ventral organoids using a ventralizing medium containing sonic hedgehog activators and WNT inhibitors. They were able to reconstruct the dorsoventral axis of the telencephalon by co-culturing ventral and dorsal organoids and found that interneurons migrated from the ventral to the dorsal parts of chimeric organoids . Potentially, the major limitation for cerebral organoids at present is their rapid decrease in survival over time. Cell death, especially in the center of the organoids, increases dramatically potentially due to the lack of vascularization and penetration of nutrients and gases. Co-culture with other cell types such as endothelial cells or engineer a circulatory system might circumvent these issues in the future . Brain organoids hold promise for modeling the neurodegenerative and psychiatric diseases in a 3D environment and cerebral organoids have already provided important insights into human disease mechanisms including microcephaly , autism , Zika virus infection [63,64], and Miller Dieker syndrome (MDS) [65,66], autism  and schizophrenia . A major step in the generation of cerebral cortex in a dish has now been taken with the development of the 3D organoids. One question arose whether the in vitro differentiation models can reflect the substantial differences between human and other species. Importantly, pluripotent based models reflect the differences in timing of neurogenesis in vivo. The development of cortical culture systems from human pluripotent cells uncovered that differentiation of human cortical neurons is protracted compared to mouse. Although this could have been expected, as during murine embryogenesis cortical neurons are generated over a 6-day period, in humans the process takes more than 100 days (GW5-30) [12,30]. The fact that similar species-specific time scales are maintained in vitro suggests some form of inherent or self-regulatory mechanism exists that “times” neurogenesis. Comparison of adherent and organoid cultures from mouse, human and other primates revealed that the proliferative capacity of progenitors is regulated cell-autonomously and differs across species . This is not due to aberrant progenitor cell specification in vitro as outer radial glial (ORG) cells derived from human pluripotent stem cells have similar molecular characteristics to ORG cells isolated from human fetal brains . In addition, the ORG cells in the OSV-like region of organoids expressed the prominent markers of ORG including HOPX, FAM107A, and PTPRZ1 [53,65]. Moreover, none of the current cerebral organoid models recapitulated folding and gyrification of human brain. Recently, deletion of PTEN, an anti-proliferative protein, induced neural progenitor proliferation, which led to larger and partially folded human cerebral organoids. However, in contrast, deletion of PTEN from mouse cerebral organoids did not induce folding demonstrating species-specific regulatory mechanism that is conserved and active in vitro . The fact that human cortical neurogenesis in vitro is very protracted presents challenges for analysis of gene function and drug screening. Hence, accelerated differentiation protocols are being developed by combining different combinations and temporal regimes of small molecules, to produced cortical neurons from pluripotent stem cells in a precise and prompt way . The simultaneous inhibition of progenitor maintenance and targeted differentiation with small molecules, reduces the differentiation time to generate, for example, functional deep layer (layer VI) neurons . Another approach that is being explored to circumvent the time problem is directed differentiation using transcription factormediated differentiation [72,73]. Direct programing of pluripotent or even somatic cells to specific neuronal subtypes is an attractive prospect to generate homogeneous neuron populations. For example, conversion of somatic cells (fibroblast) to neurons by expression the transcription factors Ascl1, Brn2 (Pou3f2) and Myt1l . In this case, the procedure bypasses expansion of the pluripotent state and directly induces neurons. Interestingly, somatic cell aging hallmarks are maintained in neurons derived by direct programing, while many of the age associated epigenetic marks are reset in neurons differentiated from iPSCs and, therefore, they do not retain age-associated characteristics [75,76]. Importantly, the current cultures give-rise to relatively immature neurons that are at an early to mid-stage of cortical development [53,61,77]. Comparison of gene expression profiles of human fetal brain confirmed that organoid-derived cells resemble the early stages of brain development . In the future, it will be important to model neurons of late stages of development or even the adult brain. Towards this goal, induced aging of neurons derived from iPSCs has been attempted by expressing Progerin  or by inducing the cells with cellular stressors [6,79]. Modeling of aging in culture still remains to be a major challenge and it will be interesting to study the disease associated mechanisms in an aged brain model in the future . Conceptualization Z.E., G.C. and V.T. ; Writing – Original Draft Z.E., G.C. and V.T. ; Writing – Review and Editing Z.E., G.C. and V.T. ; Funding Acquisition V.T. ; Project Administration G.C. and V.T. ; Resources V.T. We thank the members of the Taylor lab for critical reading of the manuscript. This work was supported by the Swiss National Science Foundation, the SystemsX.ch project NeuroStemX, and the University of Basel. Molyneaux BJ, Arlotta P, Menezes JR, et al. Neuronal subtype specification in the cerebral cortex. Nat. Rev. Neurosci 8(6), 427-437 (2007). Price DJ. Building brains : an introduction to neural development (2011). Franco SJ, Muller U. Shaping our minds: stem and progenitor cell diversity in the mammalian neocortex. Neuron 77(1), 19-34 (2013). Lui JH, Hansen DV, Kriegstein AR. Development and evolution of the human neocortex. Cell 146(1), 18-36 (2011). Shen Q, Wang Y, Dimos JT, et al. The timing of cortical neurogenesis is encoded within lineages of individual progenitor cells. Nat. Neurosci 9(6), 743-751 (2006). Gaspard N, Vanderhaeghen P. Laminar fate specification in the cerebral cortex. F1000. Biol. Rep 36(1), (2011). Wonders CP, Anderson SA. The origin and specification of cortical interneurons. Nat. Rev. Neurosci 7(9), 687-696 (2006). Shi Y, Kirwan P, Livesey FJ. Directed differentiation of human pluripotent stem cells to cerebral cortex neurons and neural networks. Nat. Protoc 7(10), 1836-1846 (2012). Lodato S, Shetty AS, Arlotta P. Cerebral cortex assembly: generating and reprogramming projection neuron diversity. Trends. Neurosci 38(2), 117-125 (2015). Fietz SA, Huttner WB. Cortical progenitor expansion, self-renewal and neurogenesis-a polarized perspective. Curr. Opin. Neurobiol 21(1), 23-35 (2011). Lewitus E, Kelava I, Huttner WB. Conical expansion of the outer subventricular zone and the role of neocortical folding in evolution and development. Front. Hum. Neurosci 7424 (2013). Evans MJ, Kaufman MH. Establishment in culture of pluripotential cells from mouse embryos. Nature 292(5819), 154-156 (1981). Bradley A, Evans M, Kaufman MH, et al. Formation of germ-line chimaeras from embryo-derived teratocarcinoma cell lines. Nature 309(5965), 255-256 (1984). Thomson JA, Itskovitz-Eldor J, Shapiro SS, et al. Embryonic stem cell lines derived from human blastocysts. Science 282(5391), 1145-1147 (1998). Takahashi K, Tanabe K, Ohnuki M, et al. Induction of pluripotent stem cells from adult human fibroblasts by defined factors. Cell 131(5), 861-872 (2007). Stadtfeld M, Hochedlinger K. Induced pluripotency: history, mechanisms, and applications. Genes. Dev 24(20), 2239-2263 (2010). Takahashi K, Okita K, Nakagawa M, et al. Induction of pluripotent stem cells from fibroblast cultures. Nat. Protoc 2(12), 3081-3089 (2007). Maeder ML, Gersbach CA. Genome-editing Technologies for Gene and Cell Therapy. Mol. Ther 24(3), 430-446 (2016). Hockemeyer D, Wang H, Kiani S, et al. Genetic engineering of human pluripotent cells using TALE nucleases. Nat. Biotechnol 29(8), 731-734 (2011). Hockemeyer D, Soldner F, Beard C, et al. Efficient targeting of expressed and silent genes in human ESCs and iPSCs using zinc-finger nucleases. Nat. Biotechnol 27(9), 851-857 (2009). Xue H, Wu J, Li S, et al. Genetic Modification in Human Pluripotent Stem Cells by Homologous Recombination and CRISPR/Cas9 System, Humana Press, New York (2014). Cong L, Ran FA, Cox D, et al. Multiplex genome engineering using CRISPR/Cas systems. Science 339(6121), 819-823 (2013). Powell SK, Gregory J, Akbarian S, et al. Application of CRISPR/Cas9 to the study of brain development and neuropsychiatric disease. Mol. Cell. Neurosci 82(1), 157-166 (2017). Malankhanova TB, Malakhova AA, Medvedev SP, et al. Modern Genome Editing Technologies in Huntington's Disease Research. J. Huntingtons. Dis 6(1), 19-31 (2017). Hansen DV, Rubenstein JL, and Kriegstein AR. Deriving excitatory neurons of the neocortex from pluripotent stem cells. Neuron 70(4), 645-660 (2011). Tiberi L, Vanderhaeghen P, van den Ameele J. Cortical neurogenesis and morphogens: diversity of cues, sources and functions. Curr. Opin. Cell. Biol 24(2), 269-276 (2012). van den Ameele J, Tiberi L, Vanderhaeghen P, et al. Thinking out of the dish: what to learn about cortical development using pluripotent stem cells. Trends. Neurosci 37(6), 334-342 (2014). Ying QL, Stavridis M, Griffiths D, et al. Conversion of embryonic stem cells into neuroectodermal precursors in adherent monoculture. Nat. Biotechnol 21(2), 183-186 (2003). Chen JK, Taipale J, Cooper MK, et al. Inhibition of Hedgehog signaling by direct binding of cyclopamine to Smoothened. Genes. Dev 16(21), 2743-2748 (2002). Qian X, Shen Q, Goderie SK, et al. Timing of CNS cell generation: a programmed sequence of neuron and glial cell production from isolated murine cortical stem cells. Neuron 28(1), 69-80 (2000). Gaspard N, Bouschet T, Herpoel A, et al. Generation of cortical neurons from mouse embryonic stem cells. Nat. Protoc 4(10), 1454-1463 (2009). Chambers SM, Fasano CA, Papapetrou EP, et al. Highly efficient neural conversion of human ES and iPS cells by dual inhibition of SMAD signaling. Nat. Biotechnol 27(3), 275-280 (2009). Pauklin S, and Vallier L. Activin/Nodal signalling in stem cells. Development 142(4), 607-619 (2015). Espuny-Camacho I, Michelsen KA, Gall D, et al. Pyramidal neurons derived from human pluripotent stem cells integrate efficiently into mouse brain circuits in vivo. Neuron 77(3), 440-456 (2013). Siegenthaler JA, Ashique AM, Zarbalis K, et al. Retinoic acid from the meninges regulates cortical neuron generation. Cell 139(3), 597-609 (2009). Smukler SR, Runciman SB, Xu S, et al. Embryonic stem cells assume a primitive neural stem cell fate in the absence of extrinsic influences. J Cell Biol 172(1), 79-90 (2006). Desbaillets I, Ziegler U, Groscurth P, et al. Embryoid Bodies: An In Vitro Model of Mouse Embryogenesis. Exp. Physiology 85(6), 645-651 (2000). Bain G, Kitchens D, Yao M, et al. Embryonic stem cells express neuronal properties in vitro. Dev. Biol 168(2), 342-357 (1995). Kelly CM, Zietlow R, Dunnett SB, et al. The effects of various concentrations of FGF-2 on the proliferation and neuronal yield of murine embryonic neural precursor cells in vitro. Cell. Transplant 12(3), 215-223 (2003). Zhang SC, Wernig M, Duncan ID, et al. In vitro differentiation of transplantable neural precursors from human embryonic stem cells. Nat. Biotechnol 19(12), 1129-1133 (2001). Watanabe K, Kamiya D, Nishiyama A, et al. Directed differentiation of telencephalic precursors from embryonic stem cells. Nat. Neurosci 8(3), 288-296 (2005). Eiraku M, Watanabe K, Matsuo-Takasaki M, et al. Self-organized formation of polarized cortical tissues from ESCs and its active manipulation by extrinsic signals. Cell. Stem. Cell 3(5), 519-532 (2008). Lancaster MA, Renner M, Martin CA, et al. Cerebral organoids model human brain development and microcephaly. Nature 501(7467), 373-379 (2013). Sato T, Vries RG, Snippert HJ, et al. Single Lgr5 stem cells build crypt-villus structures in vitro without a mesenchymal niche. Nature 459(7244), 262-265 (2009). Kelava I, and Lancaster MA. Stem Cell Models of Human Brain Development. Cell. Stem. Cell 18(6), 736-748 (2016). Renner M, Lancaster MA, Bian S, et al. Self-organized developmental patterning and differentiation in cerebral organoids. EMBO. J 36(10), 1316-1329 (2017). Lancaster MA, and Knoblich JA. Organogenesis in a dish: modeling development and disease using organoid technologies. Science 345(6194), 1247125 (2014). Pasca AM, Sloan SA, Clarke LE, et al. Functional cortical neurons and astrocytes from human pluripotent stem cells in 3D culture. Nat. Methods 12(7), 671-678 (2015). Qian X, Nguyen HN, Jacob F, et al. Using brain organoids to understand Zika virus-induced microcephaly. Development 144(6), 952-957 (2017). Qian X, Nguyen HN, Song MM, et al. Brain-Region-Specific Organoids Using Mini-bioreactors for Modeling ZIKV Exposure. Cell 165(5), 1238-1254 (2016). Israel MA, Yuan SH, Bardy C, et al. Probing sporadic and familial Alzheimer's disease using induced pluripotent stem cells. Nature 482(7384), 216-220 (2012). Yang J, Li S, He XB, et al. Induced pluripotent stem cells in Alzheimer's disease: applications for disease modeling and cell-replacement therapy. Mol. Neurodegener 11(1), 39 (2016). Hoffman GE, Hartley BJ, Flaherty E, et al. Transcriptional signatures of schizophrenia in hiPSC-derived NPCs and neurons are concordant with post-mortem adult brains. Nat Commun 8(1), 2225 (2017). Brennand KJ, Simone A, Jou J, et al. Modelling schizophrenia using human induced pluripotent stem cells. Nature 473(7346), 221-225 (2011). Young-Pearse TL, Morrow EM. Modeling developmental neuropsychiatric disorders with iPSC technology: challenges and opportunities. Curr. Opin. Neurobiol 3666-73 (2016). Madison JM, Zhou F, Nigam A, et al. Characterization of bipolar disorder patient-specific induced pluripotent stem cells from a family reveals neurodevelopmental and mRNA expression abnormalities. Mol. Psychiatry 20(6), 703-717 (2015). Watmuff B, Berkovitch SS, Huang JH, et al. Disease signatures for schizophrenia and bipolar disorder using patient-derived induced pluripotent stem cells. Mol. Cell. Neurosci 7396-103 (2016). Bagley JA, Reumann D, Bian S, et al. Fused cerebral organoids model interactions between brain regions. Nat. Methods 14(7), 743-751 (2017). Mariani J, Coppola G, Zhang P, et al. FOXG1-Dependent Dysregulation of GABA/Glutamate Neuron Differentiation in Autism Spectrum Disorders. Cell 162(2), 375-390 (2015). Cugola FR, Fernandes IR, Russo FB, et al. The Brazilian Zika virus strain causes birth defects in experimental models. Nature 534(7606), 267-271 (2016). Dang J, Tiwari SK, Lichinchi G, et al. Zika Virus Depletes Neural Progenitors in Human Cerebral Organoids through Activation of the Innate Immune Receptor TLR3. Cell. Stem. Cell 19(2), 258-265 (2016). Bershteyn M, Nowakowski TJ, Pollen AA, et al. Human iPSC-Derived Cerebral Organoids Model Cellular Features of Lissencephaly and Reveal Prolonged Mitosis of Outer Radial Glia. Cell. Stem. Cell 20(4), 435-449 (2017). Iefremova V, Manikakis G, Krefft O, et al. An Organoid-Based Model of Cortical Development Identifies Non-Cell-Autonomous Defects in Wnt Signaling Contributing to Miller-Dieker Syndrome. Cell. Rep 19(1), 50-59 (2017). Stachowiak EK. Cerebral organoids reveal early cortical mal development in schizophrenia—computational anatomy and genomics, role of FGFR1. Trans. Psychiatry (2017). Otani T, Marchetto MC, Gage FH, et al. 2D and 3D Stem Cell Models of Primate Cortical Development Identify Species-Specific Differences in Progenitor Behavior Contributing to Brain Size. Cell. Stem. Cell 18(4), 467-480 (2016). Pollen AA, Nowakowski TJ, Chen J, et al. Molecular identity of human outer radial glia during cortical development. Cell 163(1), 55-67 (2015). Li Y, Muffat J, Omer A, et al. Induction of Expansion and Folding in Human Cerebral Organoids. Cell. Stem. Cell 20(3), 385-396 (2017). Qi Y, Zhang XJ, Renier N, et al. Combined small-molecule inhibition accelerates the derivation of functional cortical neurons from human pluripotent stem cells. Nat. Biotechnol 35(2), 154-163 (2017). Pang ZP, Yang N, Vierbuchen T, et al. Induction of human neuronal cells by defined transcription factors. Nature 476(7359), 220-223 (2011). Vierbuchen T, Wernig M. Direct lineage conversions: unnatural but useful? Nat Biotechnol 29(10), 892-907 (2011). Vierbuchen T, Ostermeier A, Pang ZP, et al. Direct conversion of fibroblasts to functional neurons by defined factors. Nature 463(7284), 1035-1041 (2010). Mertens J, Paquola ACM, Ku M, et al. Directly Reprogrammed Human Neurons Retain Aging-Associated Transcriptomic Signatures and Reveal Age-Related Nucleocytoplasmic Defects. Cell. Stem. Cell 17(6), 705-718 (2015). Tang Y, Liu ML, Zang T, et al. Direct Reprogramming Rather than iPSC-Based Reprogramming Maintains Aging Hallmarks in Human Motor Neurons. Front. Mol. Neurosci 10359 (2017). Di Lullo E, and Kriegstein AR. The use of brain organoids to investigate neural development and disease. Nat. Rev. Neurosci 18(10), 573-584 (2017). Miller JD, Ganat YM, Kishinevsky S, et al. Human iPSC-based modeling of late-onset disease via progerin-induced aging. Cell. Stem. Cell 13(6), 691-705 (2013). Liu GH, Qu J, Suzuki K, et al. Progressive degeneration of human neural stem cells caused by pathogenic LRRK2. Nature 491(7425), 603-607 (2012).